TOKAJI.com .::. 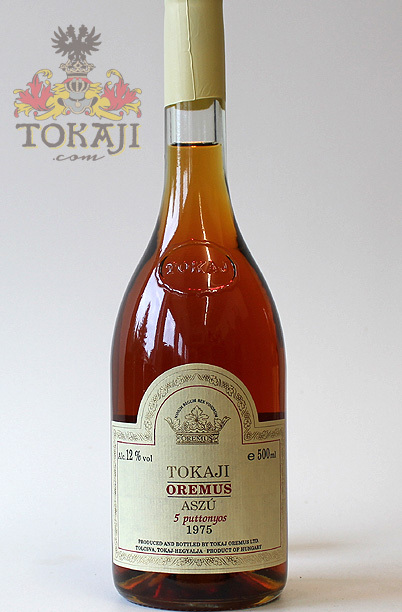 Buy Historic Tokaji : 1975 Oremus Tokaji Aszú 5 put. You are here: Home BUY TOKAJI Buy Historic Tokaji 1975 Oremus Tokaji Aszú 5 put. Excellent vintage in Tokaj. Deep flavors of apricot and peach with great honey character. This wine was still in casks, when Oremus bought the Tolcsva estate and its cellars, and then bottled by the new winery in 1994. "Sweet cherry and baked tomato aromas are a bit reminiscent of a liquorous pinot. Toasted nuts and caramel along with a resinous, smoky, high-toned note not unlikereally fine old Calvados - clearly a case of very attractive oxidation. Long smoky, nutty finish." "Rich, vivid gold colour. Complex nose features caramel, dried fruits (especially raisins and dried apricots), lemon peel, spice and brown sugar. Sweet on the palate, with great balancing acidity, the wine is crammed with layers of ripe fruit. Fresh, clean finish and very long length - irresistable."